A Fort Bragg soldier was killed June 24 while supporting Operation Enduring Freedom, the Department of Defense announced Monday. Staff Sgt. Edwardo Loredo, 34, a native of Houston and an infantryman with 2nd Battalion, 508th Parachute Infantry Regiment, 4th Brigade Combat Team, was killed by an improvised explosive device during a dismounted operation in the Arghandab River Valley in Afghanistan. Loredo joined the Army on Oct. 5, 1999 and entered training at Fort Benning, Ga. After he completed his training, Loredo reported to Camp Ederle in Vicenza, Italy, where he joined the 1st Battalion, 508th Parachute Infantry Regiment, 173rd Brigade Combat Team, according to a news release from the 82nd Airborne Division. In March 2003, Loredo deployed to Iraq for six months before returning to Italy and serving as traffic management coordinator with the 663rd Movement Control Team and finishing his enlistment in August 2004. Loredo rejoined the Army on Sept. 29, 2004 and returned to duty as an infantryman with 1st Battalion, 508 Parachute Infantry Regiment, deploying to Afghanistan from February 2005 to February 2006. Loredo was reassigned to Company F, 51st Infantry (Long Range Surveillance) at Fort Bragg in May 2007 and returned to Iraq for a 14-month deployment from July 2007 to September 2008. Loredo arrived at 2nd Battalion, 508th Parachute Infantry Regiment in October 2009 and deployed to Afghanistan in December 2009. "(He) had a presence that could brighten even the darkest rooms. With a smile that was overly contagious, he could instantly make a bad situation tolerable," said 1st Lt. Matt Jarmon, Loredo's company executive officer. Loredo's awards and decorations include the Bronze Star Medal, the Purple Heart, the Army Commendation Medal with three Bronze Oak Leaf Clusters, the Army Achievement Medal with two Bronze Oak Leaf Clusters, three Army Good Conduct Medals, the National Defense Service Medal, the Afghanistan Campaign Medal with Campaign Star, the Iraq Campaign Medal with two Campaign Stars, the Global War on Terror Expeditionary Medal, the Global War on Terror Service Medal, the Noncommissioned Officer Professional Development Ribbon with Numeral 2 device, four Overseas Service Ribbons, the Overseas Reserve Component Training Ribbon, the Combat Infantryman Badge, and the Parachutist Badge. Loredo is survived by his wife, 1st Sgt. Jennifer Loredo; his daughter, Laura Isabelle; his stepdaughter, Alexis; and his son, Eduardo Enrique. 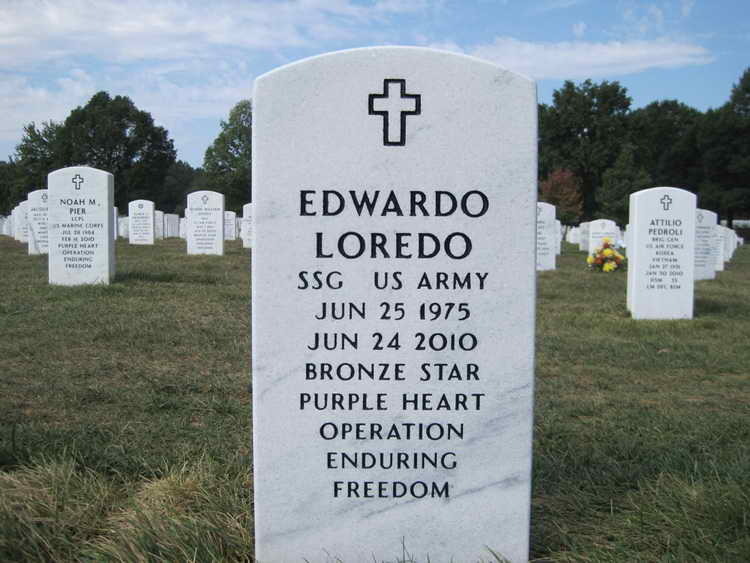 Grave marker for SSgt Edwardo Loredo in Section 60 Site 9169 of the Arlington National Cemetery Arlington (Arlington county), Virginia.